Healthy Quinoa Salad. Calling all quinoa lovers! You need to try this healthy salad recipe. I love quinoa. You probably guessed that already! I have a lot of healthy quinoa recipes on my blog. This healthy salad is my latest recipe. Quinoa is a complete protein and that’s why it’s a great choice for vegans. Quinoa is also very versatile. You can make quinoa salads, quinoa stir fries and even quinoa brownies! 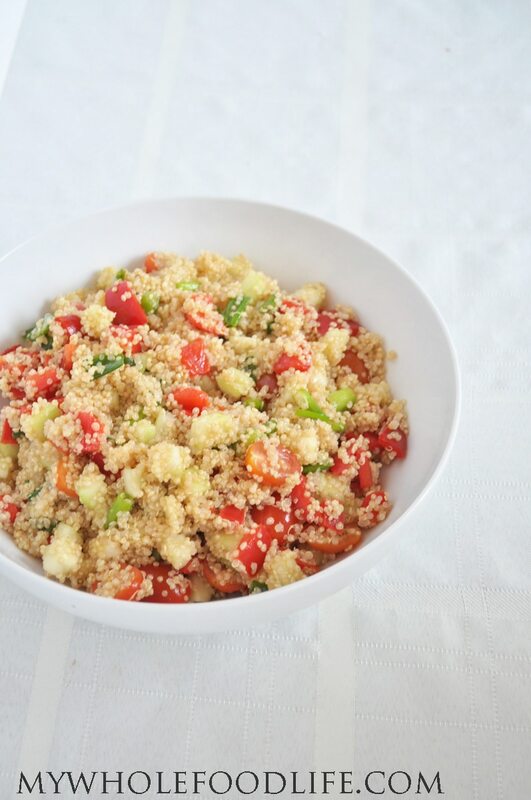 This healthy quinoa salad is very easy to make and it would be a great dish for potlucks! 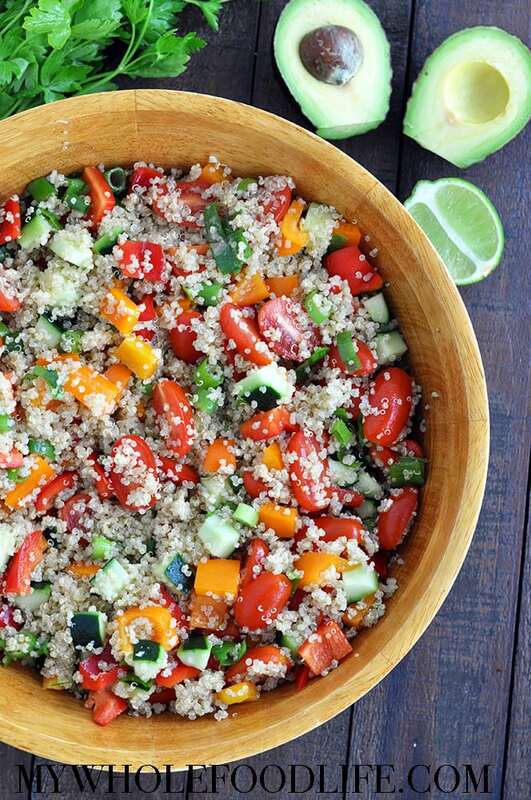 Not only is this quinoa salad healthy, it can be made in a matter if minutes! I always have a big batch of cooked quinoa in the fridge so I can create recipes like this on a whim. This healthy salad is vegan and gluten free as well. The perfect healthy salad for any potluck or party! This gets better after it sits overnight. The flavors have more time to develop. This salad should keep in the fridge for at least a week. I also think adding some spinach and avocado would be delicious as well. Enjoy! You're welcome! I hope you enjoy the recipe! I'm always looking for new quinoa recipes. This one looks SO wholesome. Can't wait to try it. Thanks Mona! I hope you enjoy it. Yummy! That looks amazing and I love all the ingredients. Will definitely have to make. thank you for this. I love quinoa. You're welcome! I love it too. Thanks Melissa for the recipe! I just make it the first time (as well as cooking quinoa the first time with your instruction). Took a test bite and loved it. However, I'm planning to sub apple cider vinegar with 2 T lemon juice. What do you think? Somehow, I don't like the smell of apple cider vinegar (I don't have the same brand as yours, not sure where to buy same brand (I'm from Ottawa, Ontario, Canada). Also, what would you eat this salad with? Do you eat just this for lunch or dinner? Sorry if I have too many questions. I normally eat Vietnamese food but would like to try something new or "Western" like for the kids. Oh, by the way, my mother lives close to Richardson, TX. We visited her 2 summers ago. Thanks again, Melissa! So glad you liked it Thuy! Yes lemon juice would work great in this recipe as well. I eat this salad for lunch or dinner. Quinoa is a complete protein, so it can be eaten for any meal. How funny that you came here to Texas! I didn't grow up here, but we like living here. Oh I love this!! First time to try quinoa. I just love it and this recipe is so flavorful! I make it about 3 times a week now. I sub the cucumbers for zucchini though. Thank you so much Melissa for this and all your other yummy and healthy recipes!!! Just made this today. I added avocado and black beans since I had some that I really needed to use today. The salad is delicious! Can't wait to see how good it will be tomorrow after it has had a chance to sit. So glad you liked it Ellen and I love your additions. I will try that next time too! So delicious and simple to make! Thank you!